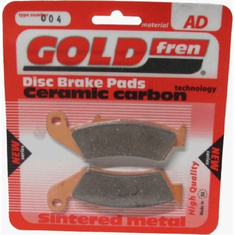 GOLDfren only manufactures sintered brake pads. 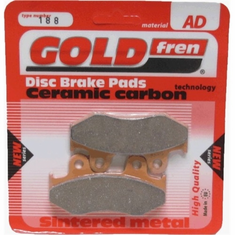 Our Sintered brake pads contain metal-ceramic and ceramic-carbon friction materials which allow for less friction material dust and a much quieter braking experience by dampening the noise by generating a frequency beyond the human hearing range. 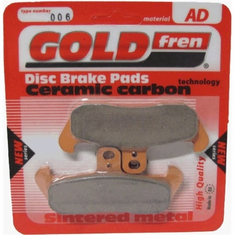 Our sintered brake pads are manufactured with a modern method of powder metallurgy under the GOLDfren brand. Our proven manufacturing technology and essential quality control system ensures reaching the required material properties, namely high thermal, mechanical endurance and high friction coefficient for the greatest braking effect and longevity even under the heaviest braking conditions. 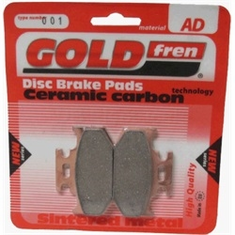 We use “non-aggressive” materials on our brake pads making sure that high friction levels are achieved while preserving the rotor wear and tear levels to a minimum. The materials used are environmentally friendly, and DO NOT contain any of the following harmful materials: lead, asbestos, fiber glass or formaldehydes.